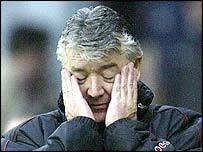 Joe Kinnear has resigned and ended his 10-month reign in charge of struggling Championship outfit Nottingham Forest. Mick Harford has taken over as acting boss, with the City Ground side languishing in 22nd place. "I feel it is in the best interests of the club that I resign and give my successor the chance to turn things around," said Kinnear. "I was brought in to save the club from relegation, but feel the time is now right to give someone else a chance." He added: "I've no regrets about joining Forest - it's the best club I've had the privilege to manage. "I've had the whole-hearted support of the chairman and my staff and marvellous backing from the supporters, which I will always be grateful for. "Unfortunately, things have conspired against us this season. We have had horrendous injuries and I haven't once been able to put out my strongest team or even a settled side. "I would like to take this opportunity to wish everyone connected with the Club all the very best for the future. "I sincerely hope to see Nottingham Forest playing their football in the Championship next season." Kinnear replaced Paul Hart as manager in February and led the Reds to a successful end of the season, but he could not repeat the trick this time around. A 3-0 defeat at local rivals Derby on Saturday proved the final straw for the former Wimbledon and Luton Town boss.